The Ford Fiesta is a phenomenal vehicle that offers the highly coveted combination of versatility and technology to make every drive an adventure. The small sedan or hatchback comes equipped with great features at every level, with the vehicle boasting a great number of standard technology and connectivity options. Customers can choose between a number of trims, including the outstanding ST model which is performance-oriented. Furthermore, drivers will appreciate the impeccable fuel economy found in the Fiesta. The Fiesta competes in the same segment as the Kia Rio, Hyundai Accent, and Sonic models. Learn more about what a used Ford Fiesta could offer you by reading below! The Ford Fiesta has been available with great engines throughout the years. One of the highlights available to the Ford Fiesta was a 1.6-liter four-cylinder that boasts 120 horsepower and 112 lb-ft of torque. Drivers have their choice between a number of transmission options, including a five-speed manual transmission and six-speed automated manual. The latter engine is called the PowerShift, and it is a specialized automatic transmission that works to shift for you, maximize fuel economy, and enhance engine power. Another amazing engine is a turbocharged EcoBoost 1.0-liter three-cylinder engine, which offers 123 horsepower and 125 lb-ft of torque. The stunning Ford Fiesta ST has been equipped with a turbocharged 1.6-liter four-cylinder with 197 horsepower and 214 lb-ft of torque, with a six-speed manual transmission. What makes the Fiesta a standout is the many options available to drivers. Ford offers two body styles, including a four-door hatchback or four-door sedan. Trim levels will vary depending on the model year, though Ford has offered the S, SE, Titanium and ST models. Each level is incredibly well-equipped, with the exterior boasting 15-inch steel wheels with wheel covers, as well as great interior features like air-conditioning, and a tilt-and-telescoping steering wheel. Technological innovations include a six-speaker sound system, CD player, as well as a variety of Sync options. Connected to the entertainment features is an iPod/USB audio interface, voice controls, Bluetooth phone connectivity, and a variety of app-subscription services. A number of high-end features are available, like a navigation system, sunroof, and cloth/leather-trimmed Recaro seats, to name a few. 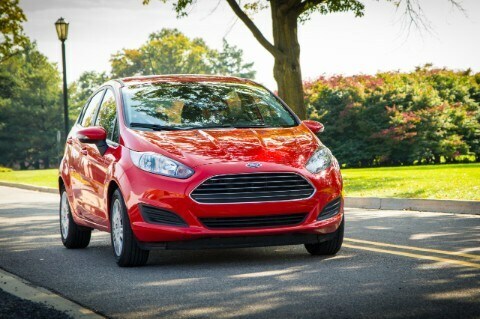 Since its debut, the Ford Fiesta has received spectacular safety scores from the Insurance Institute for Highway Safety, and in United States government tests. Each model comes standard with amazing safety and security features. Standard features for most models of the Fiesta include hill launch assist, traction and stability control, front side airbags, an integrated blind-spot mirror, and side curtain airbags. Many driver assistance features are available, including a rearview camera and rear parking sensors. Where is Kayser Used Cars located? Are there any vehicles available for under 10K? Drivers who want a versatile, efficient, and overall exciting model will love what a Ford Fiesta can offer. Offering many configuration options, including a hatchback and sedan body style, drivers are offered a terrific experience at every level with great standard features. Are you curious to learn more about a used Ford Fiesta? Contact us today, and we would be happy to set you up with a test drive!